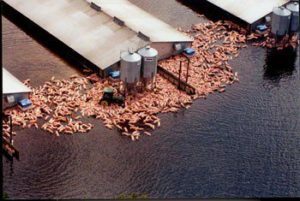 According to Mercy for Animals, over 3.4 million chickens and over 5,000 pigs have died as a result of Hurricane Florence and its associated flooding. This was an event that had several days of warning, whole communities were evacuated. Animal Evac New Zealand does not have a position on whether factory farms are right or wrong, as our constitutional rules prevent us to advocate on animal welfare issues that do not pertain to disaster management. That is so we can work with farmers, let it be traditional livestock or intensive farming operators; and respond to help without judgement should the need arise. 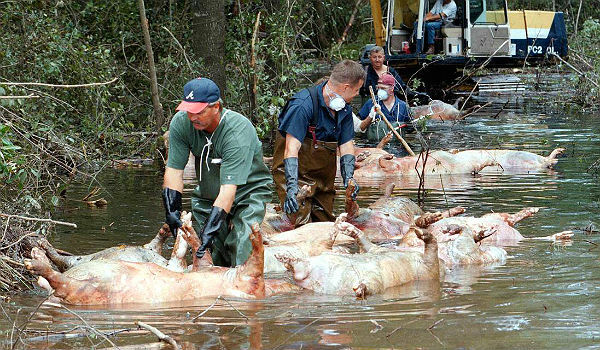 We do however, want to mitigate any animal suffering during disasters and given the majority of civil defence emergencies in New Zealand are flood or storm related, we know that there is much we can do to prevent these vulnerable animals from drowning, a sufferable death. Firstly, we advocate that in particular, intensive farming facilities are not built in disaster prone areas such as flood plains, near fault lines or exposed to tsunami or storm surge. Many however have been built in hazardous areas and so increasing their resilience is critical to animal welfare. Such resilience enhancements may include seismic bracing for cage systems, robust redundant utilities (power, water, heating and waste systems), suitable fire detection and suppression systems, creation of ponds for firefighting water supply, building “lilly pads” or raised earth where animals can naturally seek refuge above flood water, and flood barrier systems that can protect facilities and animals from water. Such mitigation systems also can prevent major environmental damage from effluent storage ponds and masses of dead animals. It makes economic and reputational sense, as there is less business interruption and prevents the negative press coverage as seen by overseas events. But there is also a legal obligation too. The defence provisions within the Animal Welfare Act 1999 that apply during times or stress or emergency, only apply if the situation was necessary for the preservation of human life. With hours to days of warning for floods, and the foresight that being in a flood zone will inevitably lead to the facility being affected by floods, means such a defence is unlikely to be acceptable and the obligations to protect animals from floods remain. Animal Evac NZ is seeking further information from the Ministry for Primary Industries to see what progress is being made around animal emergency management within the poultry and pork industries. We expect government to ensure such farm operators are provided sufficient advice and support to mitigate the disaster risks to such vulnerable animals. Farmers wanting advice or support can also contact us.